Ceramic coatings are the most durable, and best-looking protection for every surface of your car. Traditionally, to protect the paint on your car would require a deep cleaning, polish, and routine applications of a carnauba wax or sealant. However, waxes typically only last one or two months, and sealants up to 5-6 months. Fortunately, there are technologies available to us that provide long-term protection – saving you both time and money. Speedway Detail offers the complete line of Optimum Polymer Technologies ceramic clear coat systems for your car. These coatings represent the best protection against UV fading & oxidation, and chemical etching caused by bird droppings, insects, tree sap, and other contaminants. Not only do these coatings provide a durable shield, but they also add clarity and dimension to your car’s paint finish. Additionally, since contaminants will not easily bond with the paint, your maintenance washes become much easier – with a “freshly waxed” look every time. 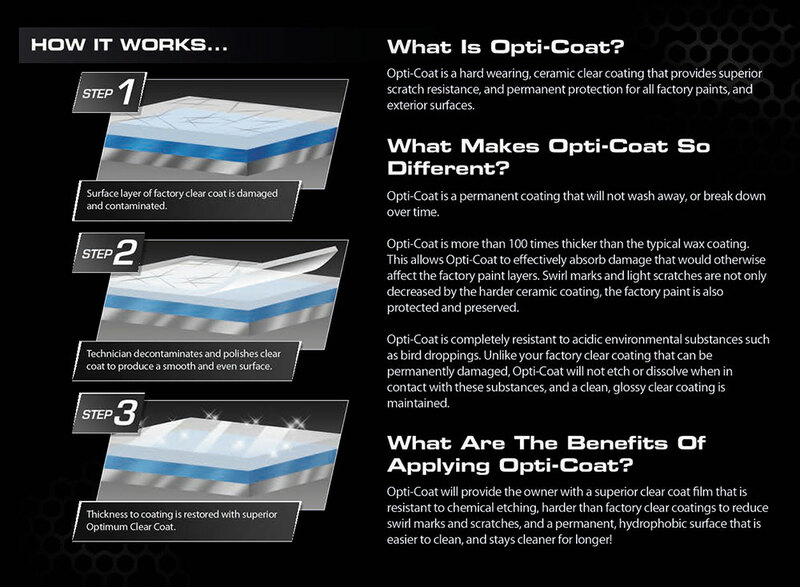 Opti-Coat Pro Plus is an enhanced 2-step version of Opti-Coat Pro. 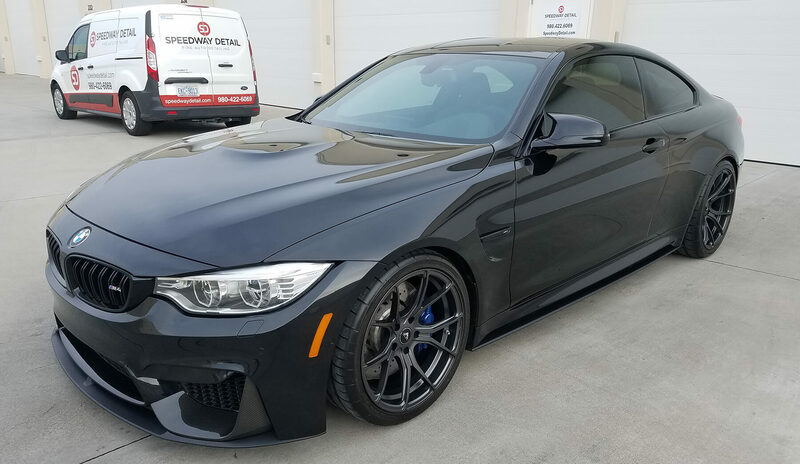 The first step, Opti-Coat Pro, is a ceramic clear coating with superior resistance to scratching, chemical etching, fading due to UV and provides outstanding release properties. Opti-Coat Pro Plus adds great gloss and slickness for a fantastic shine and long-term paint protection with a 7 year warranty. The Opti-Coat Pro pre-polymer cross-links and forms a continuous protective film on the painted surface it is applied to, similar to a single component isocyanate that forms a clear coat finish. Optimum Paint Guard comes with a 3-Year Warranty and is only available through Authorized Opti-Coat Pro Installers. Opti-Trim is a revolutionary ceramic clear coat system designed specifically to permanently solve the ongoing issue of faded plastic trim. Unlike other coatings that are limited in their lifespan and ability to prevent oxidation, Opti-Trim contains high levels of UV absorbers to help prevent future fading and provide a long-term solution. The Ultimate Solution For All Metal Surfaces! Opti-Guard Leather & Vinyl creates a hydrophobic coating with concentrated UV absorbers to protect leather seats from premature aging, cracking, and other damage such as color transfer and staining.